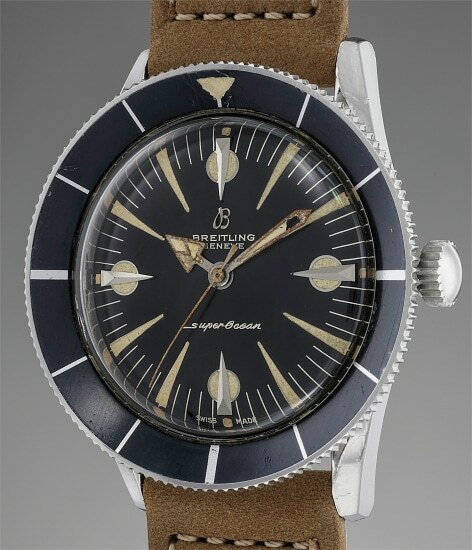 As recreational scuba diving became more and more popular as a hobby in the 1950s, Breitling devised a timepiece specifically crafted for divers: the Super-Ocean. While the popularity of this model is arguably less than that of its contemporary peers (such as the Rolex Submariner or the Blancpain 50 Fathoms), the Super-Ocean represents a hidden gem in the panorama of early diver’s wristwatch. Produced in very scarce numbers, its rarity matches the superlative looks of the piece. The watch is dominated by the large concave revolving bezel - a “must” feature of most if not all diver’s wristwatch models - but the dial as well is a masterpiece of industrial design: the large dagger luminous numerals are eminently readable in all conditions, and the addition of applied metal numerals cutting through round luminous markers at 3, 6, 9 and 12 add enormous flair and character. Finding a Super-Ocean in such superb condition as the present model is truly an outstandingly rare occurrence which makes the present lot a true hidden gem for the savvy collector of rare vintage timepieces. The firm started by Leon Breitling in 1884 is best known for its technical aviation and oceanic watches. Today, all models are outfitted with certified chronometer movements, used for accurate timing. Early aviation pioneers in specialized chronograph timepieces, Breitling introduced the circular slide rule to watches in the 1940s for use by pilots. The firm’s most iconic chronograph, the Navitimer, was introduced in 1954 and continues to be manufactured today. Another key model is the Duograph, a split-seconds chronograph that was Breitling's most prestigious wristwatch during the 1940s through '60s. Their watches are built on their reputation for precision and sturdiness.